Since the now-ubiquitous Paragraphs module provides the “paragraph” entity type, I figured these two will make good dancing partners. Getting them to tango is simple enough. 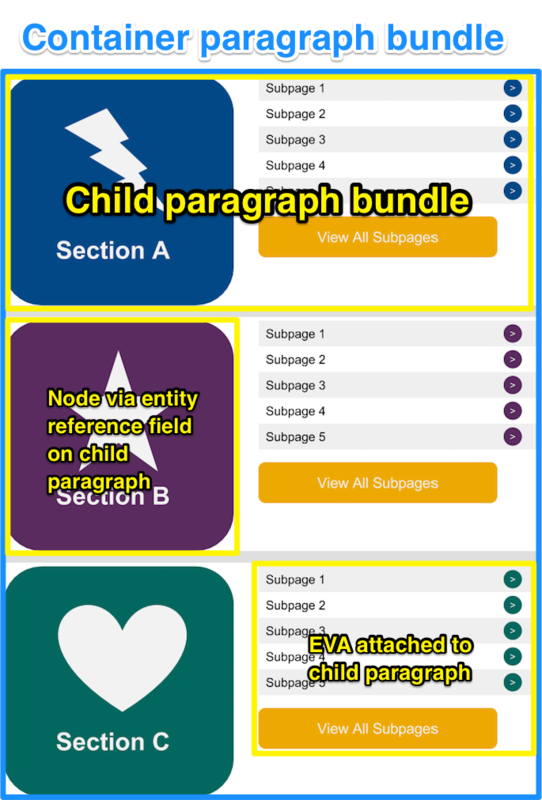 You create a paragraph bundle, target that bundle in the settings on an EVA view display, then arrange the view in the paragraph’s display settings. Voila – your view display shows up wherever you add this paragraph! By attaching a view display to a paragraph entity and enabling that paragraph on a node’s paragraph reference field, you give your content editors the ability to place a view wherever they want within their page content. Better still, they can contextualize what they are doing since this all happens in the edit form where the rest of the node content lives. 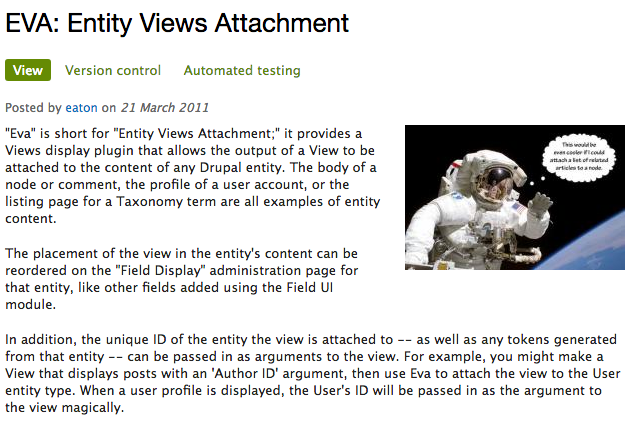 As far as I can tell, no other approach in the Drupal ecosystem (I’m looking at you Blocks and Panels) makes adding views to content this easy for your editors. 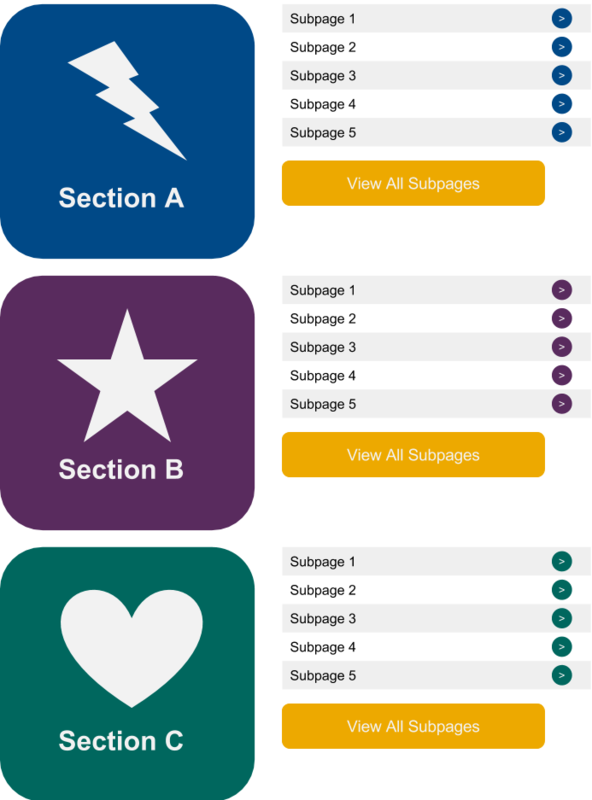 This mockup represents Sectionnodes and lists of Subpage nodes that reference them. In addition, the buttons links should point to the parent Section node. With a little elbow grease, we can build a system to output this with our friends EVA and Paragraphs. As I mentioned before, Subpage nodes will reference Section nodes. With this in mind, we can build the EVA that lists subpages and expects a section node ID to contextually filter to subpages that reference that node. Next, we’ll create the Section paragraph type that will handle each grouping of a section node with its related subpages. 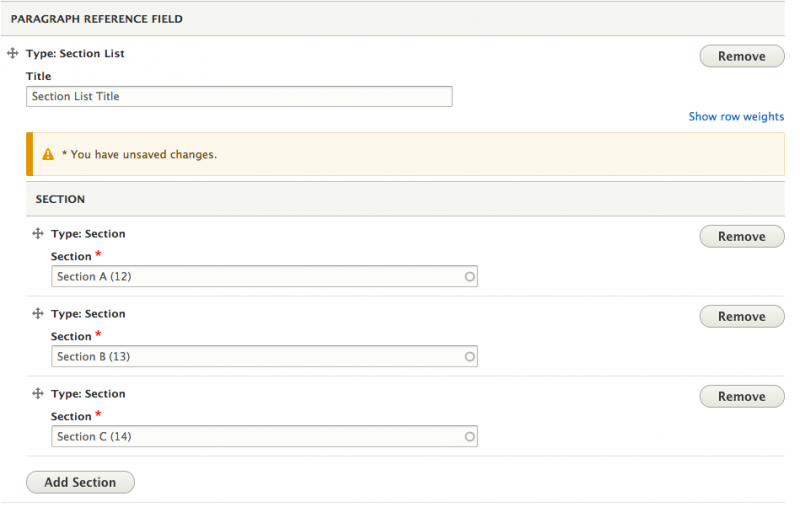 The Section paragraph will have one field, an entity reference field limited to Section nodes, that gives us all the data we need from our section. Lastly, we’ll create theSection List paragraph type. This only really needs a paragraph reference field that only allows the user to add Section paragraphs, but I also added a title field that will act as a header for the whole list. Tip: Install Fences module to control your field’s wrapper markup. I used this here to wrap the title in <h2> tags. Do you have any cool ways you use the EVA module in your builds? Let us know in the comments section below.